If you’re trying to decide which commercial roofing contractor is the best choice for your business in the Belleville, Illinois area, consider Daech & Bauer Roofing. Whether you are looking for minor repairs, want to make sure your roof is prepared to stand up to severe weather, or think it’s time for a completely new roof, we can provide an affordable solution. In fact, we’re so confident in our prices that we offer an “apples to apples” guarantee that says we will match any local competitor that offers the same products and services for less. When you choose Daech & Bauer to install a new roof on your business, we will provide a total roofing system that is designed to last. The first step in the process is ensuring that your new roof is completely waterproof, especially in areas where water tends to collect such as valleys and vents. Next, we will make sure your roof has the adhesion needed to stand up to heavy rains and winds, even in its most vulnerable areas. Finally, we will make sure your roof has the ventilation needed to prevent moisture buildup and premature deterioration. This can also reduce heat transfer between your roof and your building, which can lessen the workload on your HVAC system and potentially lead to a savings on your monthly energy bills. 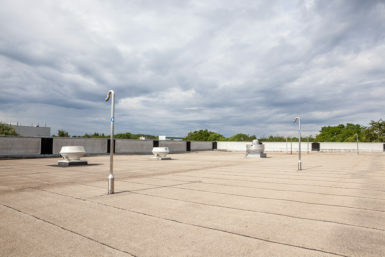 Once your commercial roofing project is complete, you can count on us to stand behind our work. In addition to the manufacturer warranties that will cover your roof, we offer a five-year workmanship warranty to protect your investment even more. Contact Daech & Bauer Roofing today to learn more about the commercial roofing services we offer in Belleville, IL and the surrounding areas.